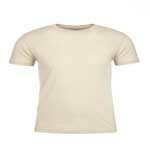 - Anvil® Adult 4.3 Ounce Lightweight T-Shirt. 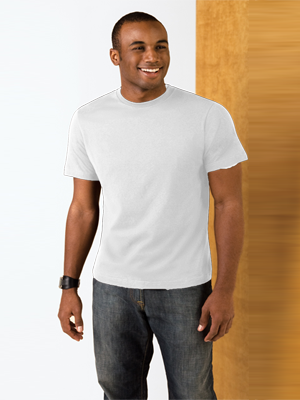 Anvil® Adult 4.3 Ounce Lightweight T-Shirt. 4.3 ounce 100% pre-shrunk combed ring spun cotton. Tubular construction with shoulder to-shoulder tape. Double-needle sleeve and bottom hem. Seamed collarette. Heather Grey is 90/10 ring spun cotton/polyester. Heather colors are 65/35 polyester/ring spun cotton. Heather Graphite is 50/50 cotton/polyester. Neon colors are 65/35 polyester ring spun cotton. TearAway label. Oeko-Tex® Standard 100 Certified. Sizes XS-4XL: Black, Heather Dark Grey, Heather Graphite, Heather Grey, Navy. Sizes XS-3XL: Neutral: White. Sizes S-4XL: Charcoal, Red, Royal Blue, Silver, Smoke. Sizes S-3XL: Canyon, Caribbean Blue, Charity Pink, Chocolate, City Green, Coral, Desert, Dusty Rose, Forest Green, Gold, Green Apple, Heather Blue, Heather Caribbean Blue, Heather City Green, Heather Dark Green, Heather Green, Heather Navy, Heather Hot Pink, Heather Orange, Heather Purple, Heather Raspberry, Heather Red, Heather Royal Blue, Heather Slate, Hot Pink, Independence Red, Kelly Green, Key Lime, Lake, Lemon Zest, Light Blue, Mandarin Orange, Maroon, Neon Blue, Neon Green, Neon Orange, Neon Pink, Neon Yellow, Orange, Orion, Paragon, Pool Blue, Purple, Spring Yellow, Storm Grey, Teal Ice, Terracotta, Violet.